What is the best horizontal mig welding technique? Seriously, thats the answer. But here are a few tips and techniques that I like to teach and that have been tested over and over by break tests, bend tests, x ray, and by sectioning. See the yellow line on the weld beads in the pics on this page? It looks like a series of little cursive e's or little loops. Another technique that works is a just a series of u's. A series of U's would look like ocean waves without any loops. The difference is that the u's travel a litter faster because you are not backing up ever. I used to be pretty adamant that you should not make loops when mig welding horizontal welds because it tends to slow you down and build up too much. But recently , I had the chance to do some experimenting with both of these horizontal mig welding techniques a lot and have found that overlapping a little bit like when you make loopy e's is usually not a problem. ... As long as you do not make a really big loop and as long as the loop part moves quickly. So which horizontal mig welding technique is better? Since each welder is different, holds the gun a little differently, uses a different angle, uses different stickout, and uses different wire speed settings, I dont think any one mig welding technique could be called the best. Again, its the one that works for you that is the best. But you should at least try the ones on this page and see what happens. The 1/4" thick multi-pass 2f tee joint was welded with 21 volts and 250 inches per minute of wire speed. 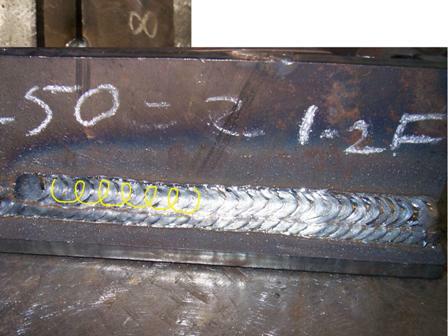 The 1/4" 2f lap joint was welded with 20 volts and 240 inches per minute of wire speed.